Reading progress update: I've read 12%. 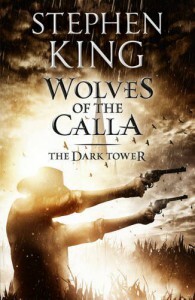 I really did not expect I would be so excited to meet the main characters again - I will not name the characters because it could spoil one of the previous books in this series (might be you did not read The Dark Tower series yet - I can tell you: you have to. It's great ^^). It's just like: "Hey, I missed you all so much! I am so damn glad I'll be with you some hours more ..."
And I really, really love that cover. It's awesome and I can't stop myself adoring it. Hodder did some great work here.